“We’re going to give everyone a great show; make sure you come out and support. Once you’re inside you should be warm and kept plenty entertained by the fighters. “It should be an entertaining fight, but at end of the day I’m going to come out victorious. “I’ve seen Jean fight on film. He’s tough. He’s got good speed and power, basically everything that you look for in a fighter. It’s going to be a good challenge. “I can show you how I come back from a knockout better than I can tell you; you’ll see Saturday night. You just have to forget it, it can happen to the best of us. Even basketball players shoot air ball free throws; sometimes that’s just what happens. I didn’t have a hard time dealing with it, just seemed like the media did. “We train hard, we go into the fight and we are there to win, but of course there’s a chance you can lose. That’s what happened [with his fight against Lucas Matthysse], but you just have to pick yourself up and move on. “I have always been someone who thinks you can only be distracted if you allow it. If you don’t allow distractions, then, they won’t happen. I could train every day in this room with all these people in it and I won’t have any distractions. But when you want distractions you’ll have them. I always like to say that I’m here, but I’m not here, my family knows I take this very seriously and they know not to bother me. “I don’t feel like I have any pressure on me. I don’t feel like I have to prove anything. At the end of the day, I love boxing. That’s why I’m going to fight Saturday night. If I feel like I have to prove you wrong, I’ll stress myself out, so, I just don’t. 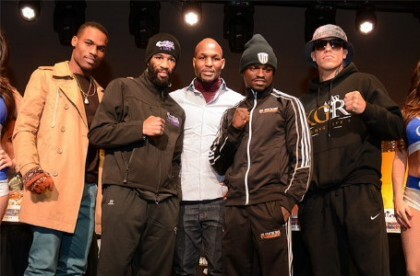 “It’s a pleasure to share the ring with Lamont Peterson. He’s a good fighter. “I consider Dierry Jean the top pound-for-pound fighter in Canada, and there are some very good fighters in Canada. “We are here, not as tourists, but for the show and for the belt, and we are going to get that belt. “It is our turn to shine, it is Dierry Jean’s time to shine. “People have said that Dierry has not fought the level of opposition that Lamont has, but he has fought very good opposition. Everyone needs a chance and this is ours. “Saturday I’m coming here with the mentality of ‘lets get it,’ ‘got to get it,’ ‘lets go.’ I’m not playing games, I live like this and I was brought up for this. “I started when I was eight-years-old and I’m extremely grateful I have a competitor as a twin brother. We struggled together, we worked hard together, we grew up together and now we’re at a stage in our lives and careers where we have to put up or shut up. We’ve got to stand strong for family. “I have to win with a KO, it’s a must. The way I grind, I know I push myself to the limit. My standards are high right now, I want titles and I want to be recognized as one of the top 154-pounders. “I’ve come up short and unfortunately the last fight was a title fight where I suffered a cut late in the fight. I felt that it was a premature stoppage, I felt like momentum was on my side. It was the game plan in the fight, to get Quillin late. He’s a strong fighter and you don’t want to make mistakes with him early. That’s why it’s a 12-round fight for a reason. “I’m excited because this is a new year and I’m now going back down to super welterweight where I have unfinished business. Last time I fought at 154 was 2012, when I had a great year knocking out Soto Karass, knocking out Powell, and clinching the No. 1 spot in the IBF knocking out Whittaker. “There’s no secret to my game plan, I’m going to go out and apply smart pressure. I’m not trying to let this go in the hands of the judges. I’m going for the knockout. I’ve already experienced that with J’Leon Love and Peter Quillin, so I want to put my destiny in my own hands. That doesn’t mean I’m going to be reckless, I’m a young veteran. I know how to set a guy up and that’s the plan. “I think my experience will show against Charlo, I respect Charlo for taking this fight because it’s a really tough fight. I commend him for that. I think he believes in himself, but I believe in myself too. This is about experience and I’m only 28 and I’m reaching my prime. The fans haven’t seen the best of me yet. “I’m glad to be here in DC, where I have a personal history, but right now it’s about these guys up here. They’re trying to establish themselves as up and coming. “We believe Gabe received the shot because of the effort that he put together in 2013 on the cuts with Quillin in New Jersey and the Love fight. We don’t know what the outcome would have been. “I want to say to all of the fighters here today that even if you come up short, when you put that sincere effort forward to stand out amongst your peers, we are going to support you. “I’m proud to be up here and represent SHOWTIME and to be able to definitively say that our network is the No. 1 destination for sports programming in premium television. We have been able to do that over the last two years on the strength of shows like Inside the NFL and60 MINUTES SPORTS, but boxing for nearly 30 years has been the flagship of sports programming on the network and it will remain as such. “In the last two years we have risen our SHOWTIME boxing back to prominence by televising the biggest events featuring the brightest stars in the sport and in the most significant fights of their careers. Over the last two years we have been able to exponentially increase our ratings and our viewership has risen a remarkable 60 percent over those two years. “We intend to continue that success in 2014 and that all begins at the DC Armory this Saturday night, with our first SHOWTIME CHAMPIONSHIP BOXING event of the year. The fighters on this card, especially Lamont Peterson and Gabriel Rosado, they have faced the toughest challenges in their divisions over the past two years and they’re doing so again Saturday night.